The normal sequence of events that leads to creating a punch list starts when the Contractor believes that the project has achieved a level of substantial completion. The Contractor requests that the Architect issue a Certificate of Substantial Completion to formalize this important event in the life of a project. At the time the Contractor requests this certificate, the Contractor is also obligated to provide a list of all the items that need to be corrected or completed. Substantial completion is a term used to generally indicate that the project only has minor items to be corrected or completed and that the Owner can begin to occupy and use the project for its intended purpose. In our case that would mean that the Owner can open the doors of the Visitor Center, invite visitors in and help them plan their visit to the area and its various attractions. It would also mean that they could open their gift shop and use the office space and support areas; break room, conference room, restrooms, etc. All buildings systems would be operational which would include power, lighting, heating, cooling, fire protection, etc. It would also signal that the exterior is ready as well; parking, sidewalks, landscaping, etc. The Contractor has indicated they will have the project to a level of substantial completion on September 28, 2013. There is a strong driver for this date as the first week of October begins the Chickasaw Nation’s new fiscal year and it is celebrated with a weeklong festival of events that includes an important State of the Chickasaw Nation address by the tribal Governor. While there are many important Chickasaw events celebrated throughout the year, this is the largest and is full of significant activities that bring the membership together. The aluminum trim on the aluminum curtain wall should be cut for a tight fit that does not require caulking. The stone veneer was laid up short of the soffit. This was not evident until the wood soffit material installation began. The design intent was for a clean marriage of 2 materials; wood and stone. There is now a 2-4 inch gap that needs to be closed. These photos show various solutions proposed by the Contractor. 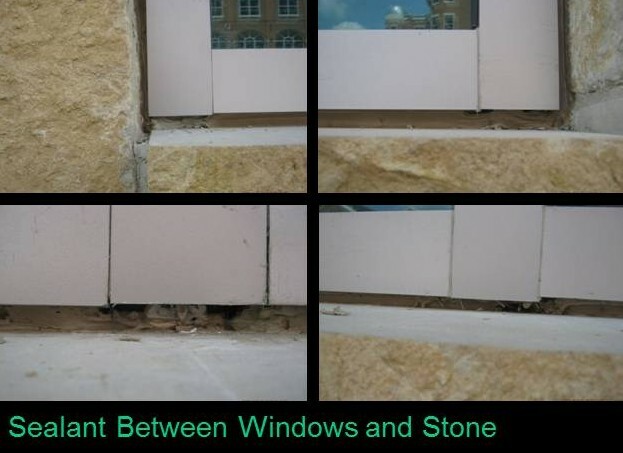 The gap between the windows and the surrounding stone is sealed with caulk. There is supposed to be a backer rod behind the sealant to give it something to be backed up to. The sealant should be neatly tooled to provide a continuous and clean joint profile. The wood ceiling in the Gallery area is an expensive material. Great care needs to be taken to neatly fit it to surrounding materials and to carefully cut openings for devices like smoke detectors that need to be incorporated into the ceiling. The metal cladding and trim continue to have quality issues that need to be corrected. We have conveyed these early punch items to be corrected to the Contractor. For some of these items, this isn’t the first time they have been brought to their attention. In some cases additional material may need to be ordered to replace those that have deficiencies. All of these items can be corrected but it’s now a question of time. This is the description of the substantial completion document and its use. At this time, the Contractor has not requested that this document be prepared. AIA Document G704-2000 is a standard form for recording the date of substantial completion of the work or a designated portion thereof. The contractor prepares a list of items to be completed or corrected, and the architect verifies and amends the list. If the architect finds that the work is actually substantially complete, the form is prepared for acceptance by the contractor and owner, and the list of items to be completed or corrected is attached. In the AIA Document G704-2000 the parties agree on the time allowed for completion of correction of items, the date when the owner will occupy the work or designated portion thereof, and a description of responsibilities for maintenance, heat, utilities and insurance.